With the introduction of chip-enabled Member cards, credit unions took a big step toward reducing the risk of card fraud. By relying on a secure chip for transactions, as opposed to the more vulnerable magnetic stripe, chip cards reduced the incidence of card skimming. However, criminals are always ready to change and adapt to any preventative measure. In recent months, tampered chip point-of-sale (POS) devices have begun to surface. 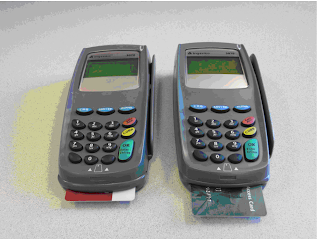 The picture below provides an example of a tampered chip POS device. The ‘clean’ POS device on the right shows how far the card needs to be inserted to engage the chip. On the left, the card needs to be inserted much farther because the grey outer shell contains a mag stripe reader that skims the card information. Both devices will process the chip transaction, so members have no clue that something is amiss, unless you know what to look for. The best advice is to remain vigilant. If you insert your card in a POS device and it doesn’t seem quite right, ask to use a different device (if the business has more than one) or consider canceling the transaction altogether.